In the Celtic calendar, the night leading into November 1st was a special date. The pagan Irish feast Samhain still finds its echo in today’s All Hallows Eve or in its Americanised fun version Halloween. According to the Celts, the 1st of November also marks the change of season and the beginning of winter, which the Welsh name Calan Geaf. 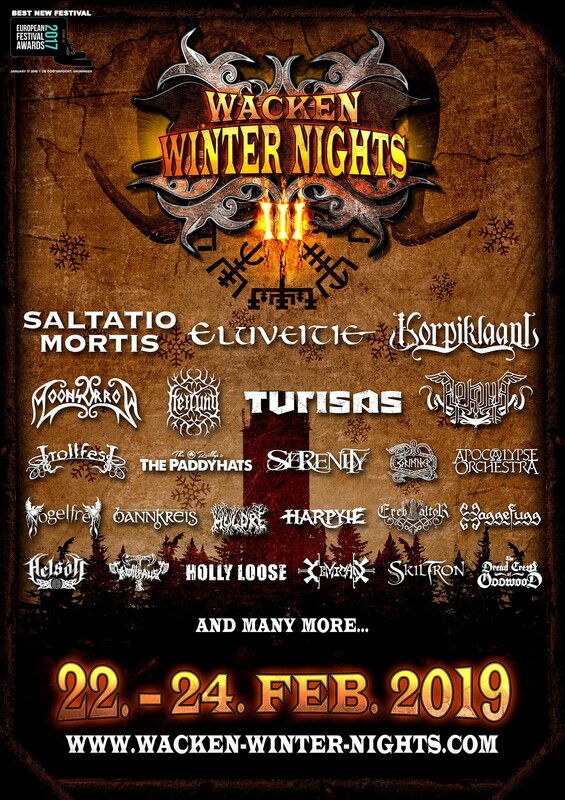 There could hardly be a more fitting date for the Wacken Winter Nights festival to announce a string of new information regarding the upcoming winter spectacle. VOGELFREY have been founded in 2004 in Hamburg and grace the Wacken Winter Nights already for a second time. This Medieval Rock act has released its fourth album ‘In Ekstase’ in 2017 and the band has performed countless shows in Germany, Austria, Switzerland, and the Netherlands. Vogelfrey have fused historical and modern sounds in an original way that is filled with the pure joy of playing and a massive level of energy. CEMICAN combine traditional Spanish music with folk metal. The Mexicans have built a massive fanbase in South America since their inception in 2008. Their breathtaking appearance at this year’s edition of the Wacken Open Air has secured their highly original mix of Aztek tribal, folk, and metal another slot at Waken Winter Nights. More than 70% of available 3 Day Passes have already been sold. We, therefore, recommend buying your ticket early if you plan to attend all days of the festival!